No matter what kind of buildings you manage or provide services for, the risk of fire for your facilities or your customers is a potential threat you can’t ignore. The International Association of Fire and Rescue Services (CTIF) reports that in 2015 there were over 760,000 structural fires. However, this statistic includes only 21 reporting countries, so we can guess the actual global number might be in the millions. In the U.S. alone, the National Fire Protection Association (NFPA) reports that in recent years there’s been an annual average of over 3,300 fires in office buildings and 37,000 in industrial or manufacturing buildings. Of these, over 5,200 are attributed to ‘fixed wiring and related equipment’ of electrical systems. During this same time, there have been over 380,000 fires annually in residential structures, with over 14,000 attributed to wiring and related equipment. If such an event happens in your home or facility, you’ll have safety procedures, equipment, and a local fire department to respond. But, of course, the best defense is prevention. In this post I’ll take a look at the types of electrical faults that can cause a fire, with a particular focus on arc faults. In my next post, we’ll look more closely at a new, innovative arc fault detection devices (AFDD) that are specifically designed to protect against arc faults causing a fire. Electrical faults that can cause fire include overloaded circuits, short circuits, earth leakage currents, over voltages, and electric arcs in connections and cables. In today’s buildings, devices such as residual current devices (RCDs), circuit-breakers, and surge protection devices (SPDs) address the risks of electric shock, circuit overloads, and lightning-induced surges. In regard to arc faults, devices called arc fault circuit interrupters (AFCI) have been available in the U.S. since 2002, and interest in arc fault protection has been increasing worldwide. Before I continue, let’s avoid some potential confusion between an arc flash versus an arc fault. Arc flash happens when the energy released during a short circuit travels through the air, causing a dangerous burst of light and sound. This has its own specific protective measures. In contrast, an arc fault occurs when an electric arc current is generated in a damaged conductor or in terminals, and the energy of the arc is enough to ignite the surrounding material. Arc faults are insidious, as the conditions for their development can go undetected for a period of time. The first possible cause of an electric arc is when a voltage is high enough to create a current discharge across the air gap between two electrodes – such as between a phase and a neutral conductor – degenerating into an irreversible arc. What often results is damaged cable insulation. Another arc fault situation that’s often found in damaged switches and power strips is a bad connection. Typically, rough edges or other irregularities means contact is made only on a very small part of the surfaces, through which all the current passes. This causes high heat, metal becomes molten, and then an arc of metal vapors is formed. Anywhere a cable is damaged or a connection is loose, there is the potential risk of a ‘series arc’ between two parts of the same cable. This happens as a localized hot spot develops which starts to carbonize the adjacent insulating materials. This carbon is conductive, allowing current to flow through it by means of electric arcs. The arcs amplify the carbonization, causing a chain reaction that eventually leads to sparking a spontaneous fire. In the case of two live conductors, a ‘parallel arc’ can form if the insulation has been damaged between the two. The current is typically too weak to be detected as a short circuit by a circuit breaker, and an RCD will not detect it unless the current goes to earth. Once again, leakage currents generate arcs that turn the insulation into carbon, and a chain reaction occurs until the carbon is lit by an arc to create a flame. The next post will explain how new AFDDs are able to detect these kinds of arc fault conditions and help avoid further damage. To learn more about this subject, refer to the white paper ‘How Arc Fault Detection Devices Minimize Electrical Fire Threats’. 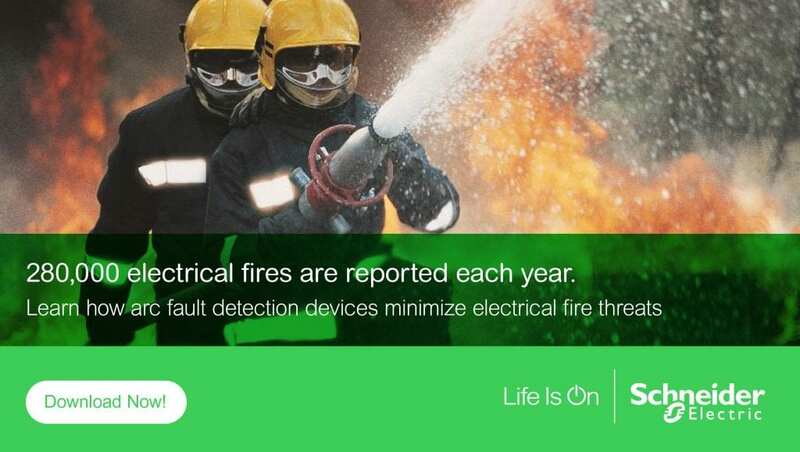 Also make sure to discover the Schneider Electric’s full range of AFDD solutions. Invisible Home Dangers: The Risk of Electrical Fire from Arc Faults Preventing Arc Faults and Fires in Buildings Using New AFDD Technology The 5 critical faults that cause electrical fires Do you know an Arc Fault Detection Device (AFDD) can prevent from an electrical fire?